While spring arrived to us already some long time ago seems that spring has arrived also in HYIP industry as well. Many good projects are starting and I see big amount of regular players are returning to HYIP industry after long break. 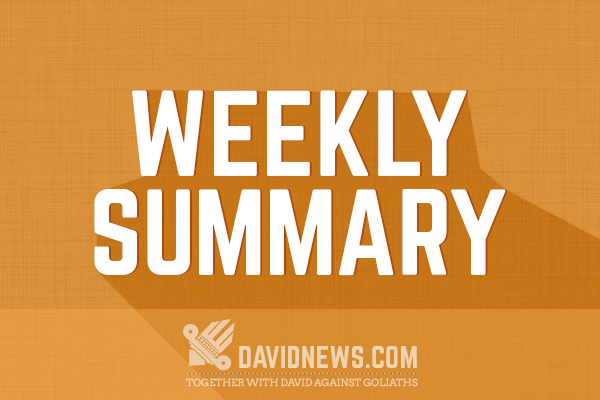 This week several interesting projects were added to DavidNews.com and I'm sure during next weeks we will see that industry will do just great, but for now it is time to sum up everything what has happened during previous week. BTC Plaza - quality made after-one-day project what is listed on Golden Stage listing, review published over here. Lionery - new and in the same high quality Golden Stage project what offers floating daily interest rate until your deposit will reach 150% return (50% profit), review will be published tomorrow. Eden Shares - popular after-one-day project what is listed on Standard listing and offers you to make at least 2% after one day, review of this project will be issued during next working week. Consumer Funds - Golden Stage project what offers you to at least double your investment during 70 days, for more information check monitor/reviews section or wait for review what will be published within next week. At first when I take a look at Lionery project I thought - nothing that particular. When project was finally added to DavidNews.com and I took more closer look and it is clear that project is very quality made and there is much work invested to make this website running. Apart from that project offers investment plan what pays variable daily interest starting from 1% up to 5% every calendar day until you will receive 150% return. For now project is still very fresh and it is difficult to talk about any success, but if you want to find more about it than I can say that review about Lionery will be published during this working week. Spring is kicking in day by day and it’s just a natural instinct to get out of the office and enjoy some quality time outside in the fresh spring air. However that’s not the case in Lionery headquarters; in fact, it’s just the opposite as Lionery has started their advertising campaign. Although we believe that the best advertising is so-called “word-of-mouth” marketing, we know that we have to keep our feet on the ground before we can achieve such brilliance. In order to expose our project to the general public, we have to turn to the industry’s most reliable blogger, who have massive amount of followers, and who will definitely help us to achieve the exposure we are looking for. We have listed our project on DavidNews.com, and you can expect a detailed review about our project in the upcoming days. We will let you know when review is published. Blogger is well known for being reliable and always “up to date” kind of people, so you can be sure that you will get the best information by visiting blog. Be sure to stay tuned for the review! As a first newsletter and second news update, I believe that it is important to reveal our main goals, which we aim to achieve in the near future. First of all we plan to establish a strong link with our customers, and we plan to do so by actively communicating with them via various forms and by providing them with lucrative returns. Secondly we plan to achieve success in the long run; we believe that the only way you can do this is by “word-of-mouth” marketing from our customers. Thus, providing a high quality service is what will push us forward. Thirdly we plan to achieve the market’s pinnacle - with hard work and dedication we believe that we can do so in a few months when our first investors will start to enjoy the fruits of our labour, or in other words, when our customers will start to enjoy their profits and will be confident in the services that we provide. Before I let you go on this fantastic spring day, I just want to let you know that soon we will launch our chat platform, where you will be able to communicate with other customers online. Stay tuned for it. That’s it for today, take care! We would like to notify you, that currently we do not accept new Payza deposits, due to business/website verification reasons. New Payza deposits will be accepted within 2 business days. We will inform you via email once deposits are back to normal. Administration this week issued two newsletters and in first one administration talks that spring has arrived and project have started advertising campaign. Administration also informed that they have added DavidNews.com blog and review will be published in near future. Second newsletter informs that project does not accept Payza deposits due some verification reasons, but administration says that deposit option should be back to normal within few days. In my mind this is one of the most promising projects in industry right now. EWT World is quality made project what pays exactly 3% daily for 90 calendar days. Thing that I like the most about EWT World is that project does not return initial deposit back at end of investment plan and this just mean that theoretically project can operate for very long period of time. Will it happen or not I do not know because time will show what will happen, but if you are interested to find more about EWT World project than you can read review over here. We have some very important news for you. We thought that it would be unfair to keep you unaware of the latest events in EWT World. The big-time opening of EWT World News Channel is the core news of the week. The first video news release is available for watching on YouTube. Our lovely news presenter Caroline will tell you a couple of facts about water in our life. And the way she is cutting a pineapple is jaw-dropping. You gotta see this! Don’t miss the chance to learn more about EWT World and how it can change your lifestyle! Do you want to know how to start earning $1758 every month with EWT World? By starting only with a hundred bucks? If you are serious and motivated with a positive attitude and seeking an opportunity to work from the comfort of your home, you cannot go wrong with EWT Profit Table. It might seem impossible not to worry about money in today’s world, but with EWT World all things are possible. This is a rare chance for you to change your whole life in a short time. Do you have variable expenses, debts, or struggle to make ends meet? It is hard to believe but a mere $100 can make you much happier than you are. Open a Time Deposit for $100 today, and soon you will be earning $1758 per month (that is over $58 daily!) Do you see the potential? Consider the extra income from investing $200, $500, $1000! Imagine this plentiful stream of income, paid like clockwork day by day! To help you manage your extra income, we have created a graphical presentation that clearly shows what you just cannot afford to be missing! Open https://ewt-world.com/profit-table and make a wise decision. By following a simple reinvestment strategy you will soon be able to afford more with daily payouts. EWT World pays 7 days a week, that’s right. As usual administration shared very long newsletter and it starts with information that project now have news channel on YouTube. To see first video look for link above, I must say that it is very interesting one and indeed worth to watch. Later in newsletter administration talks how outstanding is this investment platform and how innovative they "work". Yes, I must agree that project is doing just great job and administration is working with clients more than anyone else that I have seen around, but only time will show if such strategy will pay back or not. Also project is recommending reinvesting strategy where you can possibly make more money, but personally I do not recommend to follow that advice. This is somehow very interesting project that offers legend like no other investment project right now. Apart from interesting legend project offers very reasonable investment plans what pays included interest for 30 up to 60 days. Investment plans you can check in "monitor/reviews" section but if you want to read more deeper insight about this project you can read review about it over here. The first week of the project's activity is coming to an end, and we are ready to bring intermediate results of 5D Income. Sure we counted on success when we were launching such well-designed investment program with high-quality preparing as well with firm footing in the form of real business. And it even surpassed our expectations. Those who are following our project as an active investor or just a registered member, they also had to pay attention to how bright our occurrence was. During the first day of the project, we registered the first hundred accounts of participants from 8 countries. And it is particularly pleased that the majority of investors were from Russia because we're planning to expand our business in this country as well as we have a number of potential franchisees there at the moment. To date, we have completed our primary objectives: the project was successfully launched and we certainly could interest even the most experienced investors. Now there are registered just over 400 people in the 5D Income project, most of whom already made their deposits in various investment plans. In the three countries - Russia, China and Germany - our information partners already represent the interests of the project. You can find their contact details on the website and contact them if there are any questions. In addition to the four existing representatives we have a dozen requests from seeking the status, so that in the next few days the list of our regional representatives will be expanded in parallel with the expansion of the geography of their activities. The first week of project has helped us to understand which vector of development of communication we should to choose. We get quite a large number of various questions through e-mail and via the feedback form on the site. It speaks not only about increased interest in our investment program, but once again proves how important should communication be. So we decided in the near future besides expanding the list of representatives to add Live Chat support on the site. We're also planning to hold a video conference for novice investors, acquaint them closer with our business, describe our vision of the project and, of course, answer all questions, which by that time will appear. We remind that you can get current information on our official Facebook and VK pages. Like us and subscribe to our updates! In newsletter administration talks that first week for project is over and most of early investors have arrived from Russia. Actually in my mind is very real because Russians are always very active when it comes to HYIPs and they have clearly very big player's community. Some regional representatives have joined to support project and in the end administration just reminds about support options of this project. This is after-one-day project that is listed on DavidNews.com HYIP monitor and is online already more that two weeks what is quite a good lifetime for such type of project. I have noticed that there are many supporters for this project and I hope project will be able to do well also now when it is online already for some time. In general I have positive feelings about it but as with HYIPs you never know anything and they can surprise you at the most unexpected moment. How are you? I hope you are doing fine. Today marks our second week online. EdenShares has now been running smoothly for 14 days, and will continue to do so for a very long time. We have now reached stability. "Hit and run" members have already exited our program. We have more than enough reserve funds so they really are not a problem; our cashflow is great. We are growing at an amazing rate. Members are reinvesting bigger, and new members are signing up every day. The potential of EdenShares is very good; we will definitely be the biggest program in the months to come. Now you have found the best program to invest in, so you better not let this opportunity pass. I am sure the performance of EdenShares will even be better in the upcoming months. Recently we have started to add advertisements for EdenShares. We have listed with one of the best blogs in the industry right now, DavidNews. A review shall be published next week, and I hope you read it. A few monitors has been added as well. We only work with top and trusted monitors/blogs, and you can expect to see an honest and accurate status in their websites. Please check the status page to see the sites EdenShares is affiliated with. There will be more promotion in the months to come. I hope you are enjoying your weekend. Thank you for your continuous support. Administration shared newsletter where they talk that two weeks have been passed since project is online and project is doing just fine because "hit & run" guys have exited this project. Apart from that administration proudly announced that DavidNews.com blog is added and review will be published next week. This week that's all and I'm glad that industry is returning like it should be and things are getting better after few not that good months. I welcome you to come back tomorrow because most likely will be published review of Lionery project but in conclusion, I just want to wish you successful week with your family, your work and your investments!